Tommy Johnson Jr. is said to be racing internationally for the first time since his FIA debacle. A source has told CompetitionPlus.com, TJ will apparently drive the Rapisarda Racing dragster in Sydney, Australia during their Nitro Champs event in May. He will be filling in for Dixon who had previous commitments on the same weekend. Dixon is expected back for the ANDRA Winternationals the following event. Read more about TJ GOING INTERNATIONAL AGAIN? While the parties involved are remaining tight-lipped, CompetitionPlus.com keeps hearing mumblings that multi-time nitro champion Gary Scelzi will return to few NHRA reces this season as a pit reporter for ESPN. Details are sketchy at this moment, but we are hearing the most solid event will be Sonoma. Read more about SCELZI ON ESPN2 CREW? TOMMY JOHNSON JR. RESIGNS FROM DSR? Don Schumacher Racing's announcement former driver Spencer Massey would be rehired isn't the only personnel decision the team has had to deal with. A source close to the situation has told us track specialist/test driver Tommy Johnson Jr. tendered his resignation from the team. We'll have more on this developing situation as it unfolds. Read more about TOMMY JOHNSON JR. RESIGNS FROM DSR? UPDATED: DRAG RACING ON NBC? Don Schumacher Racing will have some exciting news coming next week from what we hear. In a publicity home run for drag racing, crews from NBC's Today Show will be in Brownsburg, Ind., to film a segment on Antron Brown to air next Friday [Feb. 8] in honor of Black History Month. This might be one of the biggest exposure moments for today's drag racing world since Force was on Leno and Melanie Troxel on ABC's Good Morning America. Read more about UPDATED: DRAG RACING ON NBC? Spencer Massey's stint on the sidelines will apparently be a short-lived one as multiple sources close to the situation have told CompetitionPlus.com a business arrangement will make the return possible. Look for the third dragster at Don Schumacher Racing to bear a familiar in-house branding on the side and made possible by a group of businessmen. The reasoning, we are told, is the team is likely to land a major sponsor with the car racing. NO SERVICE CENTRAL FOR THE GRAYS? 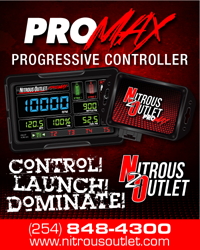 A source close to the situation has confirmed with CompetitionPlus.com the Service Central brand will no longer be the primary sponsor for either nitro racer Johnny Gray or Pro Stock racer Shane Gray. We are told both will continue to race in their 2012 settings for 2013 despite the loss of sponsorship. Read more about NO SERVICE CENTRAL FOR THE GRAYS? A DIXON AND BEARD COMBINATION? Multiple sources have confirmed with CompetitionPlus.com of a possible forthcoming alliance between driver Larry Dixon and crew chief Lee Beard. Dixon has told CompetitionPlus.com there's nothing definite at this time, and is a rumor, one of our sources tells us the forthcoming team is already in the process of hiring personnel. We are also told this program could be finalized soon. Good'ay Mate! Read more about A DIXON AND BEARD COMBINATION? Having largely been silent throughout the silly season, we have just caught wind of a major move happening in the Pro Stock Motorcycle ranks. Word has it Michael Ray has departed from the Matt Smith camp and rumors suggest, he will ride a bike for George Bryce in 2013. Ray, as you will recall, was the only rider outside of the Vance & Hines team to win a race in 2012. This leaves Matt Smith Racing with an available bike if someone is looking for a ride. MILLICAN HEADED TO BOB VANDERGRIFF RACING? After a busy off-season for Clay Millican, CompetitionPlus has learned there's a high probability the likeable Top Fuel racer from Drummonds, Tenn., will end up with a pair of teammates in 2013. Millican, and the Parts Plus Top Fuel dragster will likely end up at Bob Vandergriff Racing as a teammate to Vandergriff and JR Todd. Read more about MILLICAN HEADED TO BOB VANDERGRIFF RACING?